These Halloween salt dough decorations take shape with an easy salt dough recipe and Halloween cookie cutters. This is a great project to share with the kids – but if they simply can’t wait for the dough to dry in the oven, you might also want to consider this alternate method to make Microwave Salt Dough Ornaments. We also have a great salt dough tutorial if you are interested in learning more Salt Dough Tips and Techniques, plus a great Salt Dough Pumpkin project. Please note that the following salt dough recipe makes a lot of projects. If you only plan on making a few, cut the recipe into fourths or in half. Halloween is a fun time of year filled with lots of traditional characters. 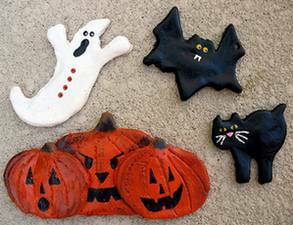 Why not bake up some fun crafts to paint this Halloween season. Use them to decorate your house, yard, or party! Roll dough flat with a rolling pin, about 1/4″ – 1/2″ thick. Use cookie cutters to cut out creatures. Use toothpick to draw lines on pumpkins. Make individual pumpkins or layer then on top of each other for a pumpkin patch look (see photo). Be sure to do this step BEFORE baking. NOTE: If you would like to poke hanger holes in the ornaments, do it now before baking. Do so by poking a toothpick into the spot where you want the hole, then move the toothpick in a circular motion widening the hole as you go. Paint creatures with two coats of paint, allowing to dry in between coats. When dry, use the handle end of the paintbrush to dot on eyes for the ghost and the bat. Use small paintbrush or toothpick to paint on cat’s eyes, nose, and whiskers as well as the bat’s fangs. Use brown paint to paint pumpkin stems, drag a little black paint over the top for effect if you like. Paint faces onto pumpkins (or use a black Sharpie marker to draw them on) and shade the sides of the pumpkins lightly with black paint.